NIEHS resources are playing a vital role in helping protect health in the aftermath of the August and September hurricanes, and they will help reduce environmental health impacts of future disasters. The institute's emphasis on community-engaged research helped NIEHS and grantees quickly mobilize, working with partners in Texas, Florida, Puerto Rico, and other hard-hit areas, according to speakers at a September workshop. Community-engaged research refers to studies in which scientists collaborate with local residents to set the research agenda and communicate findings. "Under Dr. Birnbaum's leadership, the amount of intellectual time and energy put toward this concept of working with partners at the state, local, and community levels has become a big part [of the NIEHS program]," said Gwen Collman, Ph.D., director of the NIEHS Division of Extramural Research and Training. 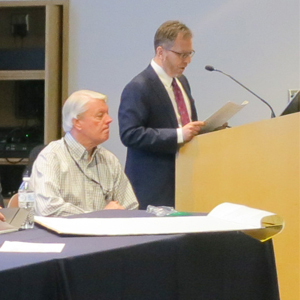 Collman spoke at a combined workshop Sept. 6-8 of two NIEHS programs. "Engaging Diverse Partners: Strategies to Address Environmental Public Health" involved the NIEHS Partnerships for Environmental Public Health (PEHP) program and the National Institutes of Health Disaster Research Response (DR2) program. Long before the hurricanes developed in the Atlantic, NIEHS leaders decided to hold the annual workshops back-to-back because of their common focus on community engagement. 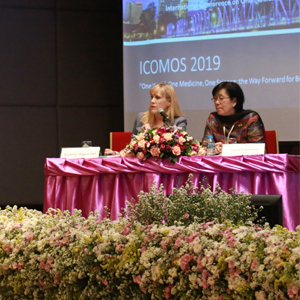 The organizers recognized the value of highlighting both successful approaches to engaging diverse partners, and effective partnerships in the aftermath of disasters. As Houston grappled with floods and Hurricane Irma approached Florida, participants heard firsthand how existing community networks play a crucial role in deploying aid and initiating research. "As soon as that storm [Hurricane Harvey] hit, it became apparent that we are building a very strong network of research responders who are trying to understand the key questions and get work underway," Collman reported. 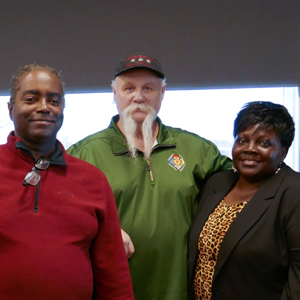 According to Joseph "Chip" Hughes Jr., who leads the NIEHS Worker Training Program (WTP) NIEHS actions were underway in three different states, representing three different federal regions. "We've been dealing with disasters since 9/11, [and] we’re trying to create tools to make your jobs easier," said WTP program analyst Jim Remington, during the DR2 session. Those tools are found on the DR2 website, which is maintained by the NIEHS partner in leading the program, the National Library of Medicine. 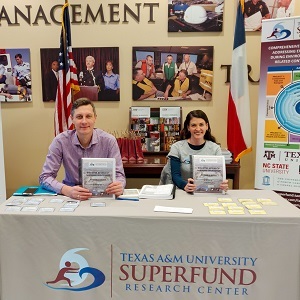 In a case of remarkable timing, Texas A&M University became home to the newest NIEHS Superfund Research Center (SRC) in August. Funding began Sept. 1, and according to Jennifer Horney, Ph.D., head of the center’s Community Engagement Core, researchers were out in the field the same day. They went to Manchester, a neighborhood surrounded by refineries, freeways, a rail yard, and water treatment facilities. SRC staff had just finished collaborating with Texas Environmental Justice Advocacy Services to take baseline soil and water samples. "By comparing to baseline, we’ll be able to see what the [contaminant] levels were post-Harvey," Horney said. Exposure data will help researchers better understand health risks in Manchester and elsewhere. Thanks in part to DR2 tools, a different sort of exposure study was launched in the Houston neighborhood of Highlands by an SRC in Oregon. Kim Anderson, Ph.D., from Oregon State University (OSU), developed silicone wristbands that collect chemicals the wearer is exposed to. Baylor College of Medicine staff helped distribute them to participants, who wore them for a week. According to Heather Henry, Ph.D., from the NIEHS Superfund Research Program, research tools created through DR2 helped enable Anderson to launch her study with 1,000 participants. Timely research to assess exposure and potential health impacts are one of the goals of DR2, according to NIEHS Senior Medical Advisor Aubrey Miller, M.D. These stories stood in stark contrast to the delays faced by researchers after the 2010 Deepwater Horizon oil spill. NIEHS epidemiologist Richard Kwok, Ph.D., explained that by the time scientists designed the Gulf Long-term Follow-up Study, or GuLF STUDY, obtained approval and funding, and recruited researchers, they had to estimate worker exposure using mathematical, chemical, and geographic data. "The lessons we learned in the GuLF STUDY helped provide the genesis of the DR2 program," Kwok said. Tabletop exercises sponsored by the DR2 program have helped local communities explore environmental health research needs in the context of realistic disasters. Program officials worked with local government, academic, and community organizations to simulate a possible disaster and work through the necessary steps and roles. In 2015, the second exercise took place in Houston, based on a scenario of a hurricane hitting Galveston, and causing flooding and possible disturbance of contaminated sediment in the Houston ship channel. "It was almost the same situation we just saw," Miller said. Rios participated in all three exercises. "We were co-organizers for the Houston exercise and it was helpful, in that we met with external stakeholders — some for the first time — and considered our individual and collective roles during a response," she said. The 2014 exercise in Los Angeles simulated an earthquake and tsunami, disrupting the Ports of Los Angeles and Long Beach. The 2016 exercise in Boston simulated flooding from a storm such as Superstorm Sandy, in the Chelsea area of the city. WTP grantee Mitch Rosen, Ph.D., from Rutgers University, reflected on current hurricane responses in light of the tabletop exercises. 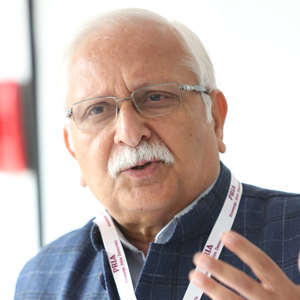 "I have seen more participation by community-based organizations in response activities," he said. Rosen also mentioned more discussion now on how to follow-up with those who are part of current response and recovery efforts.